Jean was a half-uncle to our American immigrant George. 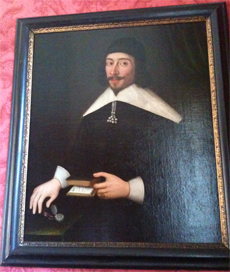 Jean was a educated man, earning his bachelors and masters at Cambridge and Phd at Oxford prior to the English Civil War. He was versed in the classical languages and performed secretarial duties of officials in the royal government, including Charles l. Jean was the first receipient of a scholarship at Oxford created by an act of Charles l.
After the war and restoration of the crown (Charles ll), he served as Lt. Bailiff for Jersey. See Page 29 of the Landers book for a thesis about Jean and Pages 97, 98 and 100 of "All for the King". In "All for the King" we learn about Jean's involvement as a Royalists in protecting Charles ll after his father was beheaded. A portrat of Jean exists from about 1635 (Landers, p. 35), prior to the civil war in England. The photo at left is of the portrait from many years ago. The black mark on his cheek is said to be from a Parliamentarian mistaking the portrait to be that of the King and stuck his sword through it. The painting has recently been repaired and cleaned and is currently well cared for in a private collection in Jersey. Your webmaster viewed it in 2013 while visiting Jersey, as shown in the photo at right. The owner does not wish to be identiified. A manuscript written by Jean Poingdestre in the latter half of the 17th Century (1600's), after the Restoration of Charles ll to the thrown. This manuscript is an interesting insite to life on the Isle of Jersey in the 17th Century and his views of the island's history. Other manuscripts written by Jean can be found at the Societie library and in various collections at universities in England. Some of these are written in Norman French, Greek and Latin. June 1998, published a biography on Jean, in French (or perhaps Jerriaise and is found on the web site of the Jersey Legal Information Board. Translated, we ran te web page through Google's translator and made this PDF. The translation is rough and the reader is advised to not expect an exact translation. Those experienced in Jersey history of the 17th Century will recognize the translation errors.